Disclaimer: I received 2XU Performance Run Calf Sleeves and Race VECTR Sock to review as part of being a BibRave Pro. Learn more about becoming a BibRave Pro (ambassador), and check out BibRave.com to review, find, and write race reviews! I'm sure you all know by now that I have a very strong, deep, loving relationship with 2XU. Ever since I tried their MCS Elite Compression Tights, I've gone on to have the opportunity to try some other products as well as purchase almost the entire line of compression tights and capris since then. (Though of course now they have a new Spring Collection out, which is amazing.) 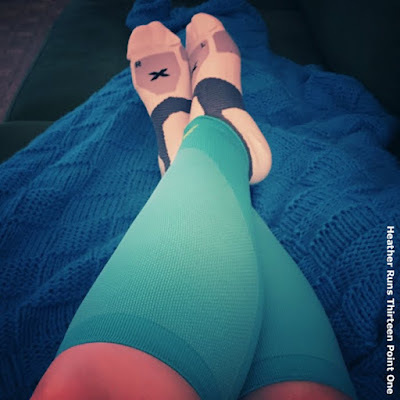 I wrote some other reviews if you're interested in reading: Hyoptik Thermal Tights (helped me get through winter training), Compression Tights, Recovery Tights, and Element Sport Jacket, and the MCS Elite Compression Tights. This time around, 2XU was giving BibRave Pros the chance to try out their 2XU Performance Run Calf Sleeves (we even got to pick which color, which for me was a tough decision because there were so many great options) and the Race VECTR socks (they chose the color that best went with the sleeves, which was thoughtful and an unexpected surprise). First off, I LOVE the color I chose for my Performance Run Calf Sleeves - they are a beautiful bright, fun Ice Green with Yellow thread for the 2XU on the front and back. I know compression can be controversial – not everyone believes in their power, but personally I believe they help me recover quicker. 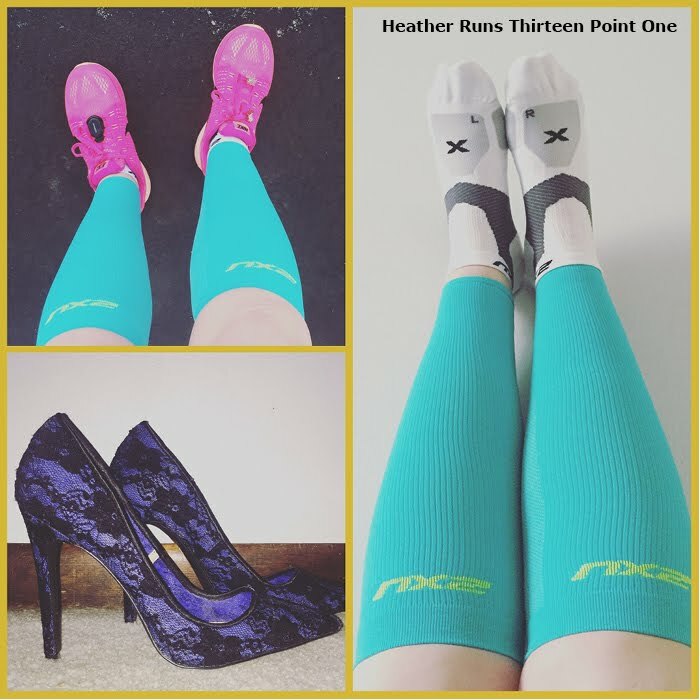 Here's a quick video that explains how the Performance Run Calf Sleeves help runners and their muscles. They feature zoned breathability panels for maximum airflow and comfort. Seamless, graduated compression zones for increased blood flow and maximum muscle containment for increased performance and enhanced recovery. • Graduated compression promote increased circulation for recovery. The garment features PWX compression fabric with enhanced power supports the shin, calf, and ankle; graduated fit to promote circulation for muscle performance and faster recovery, seamless construction for greater comfort; high filament yarns for dryness - wicks sweat from the skin to the fabric exterior; and antibacterial and UPF50+ sun protection. 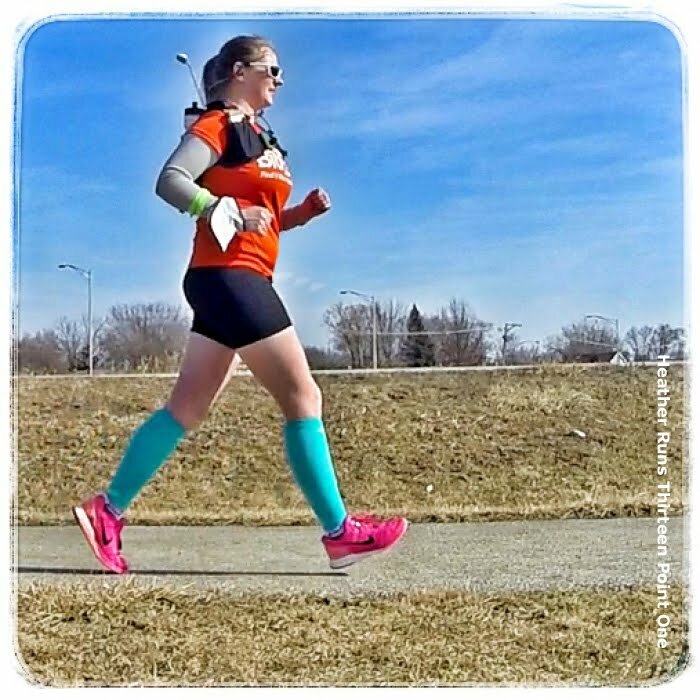 During my 111 day run streak, there were days that my calves were just tired and sore, but wearing the sleeves during my runs helped me keep my streak alive for as long as I did. 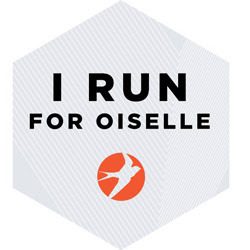 My legs felt great running in them, and I even wore them sometimes after the run as well for compression recovery. One such day was after being on my feet in heels all day long for a wedding. My legs weren't feeling so hot the next day, so I wore them for a quick run and then the rest of the day to relieve sore muscles. First time in them... the sleeves are backwards. Whoops! 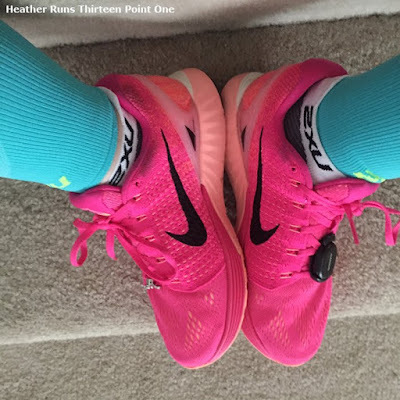 For fighting out calf sleeve size, you want to measure your calf size. Since I have some pretty decent sized calves, I went with a large. They were defnitely the proper size for my calf size, however they were a bit longer than I think they should be on someone my height. I didn't have any problems with the length – I would just make sure to have the bottoms be around my ankles so it didn't interfere with my shoes or feel uncomfortable. I feel generally it's the same with all sizings of calf sleeves – they are made for a certain calf girth, and generally my size of calf is what is expected in a taller person. Didn't bother me at all, though, just thought it was worth mentioning. While wearing the 2XU Performance Run Calf Sleeves, I also wore the Race VECTR Sock. Mine were the white/silver logo color, which worked well with my sleeves. I have problems with PF, which certainly had some flare ups during my run streak. Having some extra arch support really helped keep it in check while running. The sleeves and socks really helped me keep my run streak going strong for much longer than I was anticipating. So perhaps you see why I'm such a big fan of 2XU. Second wear... still backwards! Get it together, Heather. Am I right? Engineered for faster performance than ever before, this impressive Race VECTR sock is designed with 2XU's X:LOCK support system powered by 2XU's Compression technology for secure, ergonomic fit to the foot and stabilization of the ankle and arch. Delivering maximum abrasion protection, extra heel and forefoot cushioning, dry mesh panels for ventilation plus a linked toe cage for comfort, the Race VECTR Sock is ideal for racing and training alike. 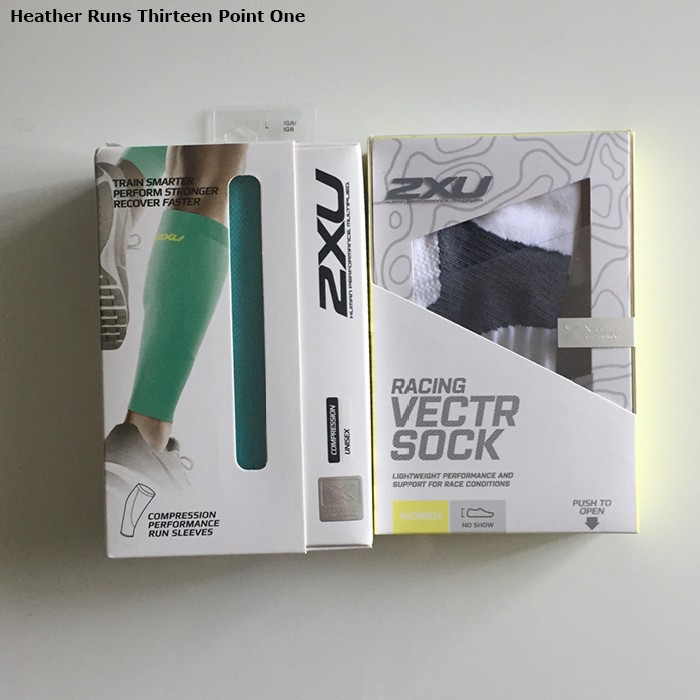 The care instructions for the Race VECTR Sock is the same as the 2XU Performance Run Calf Sleeve – wash in cold water with like colors and hang to dry away from the sun. 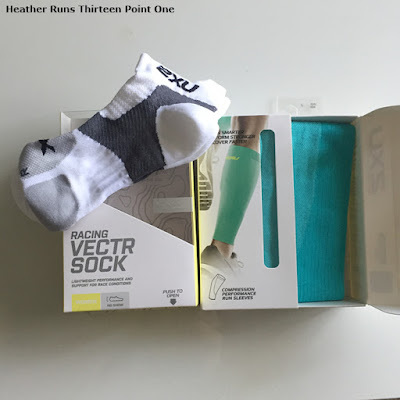 I really loved the support the Race VECTR Sock gave to my arches and helped the PF not be as painful as it was in socks that didn't have that support. I honestly believe that my run streak would have ended closer to day 70 than 111 (and the only reason I decided to end was for a minor quad injury that I didn't want to become a major injury). 2XU makes quality products and I stand by everything I've used 100%. 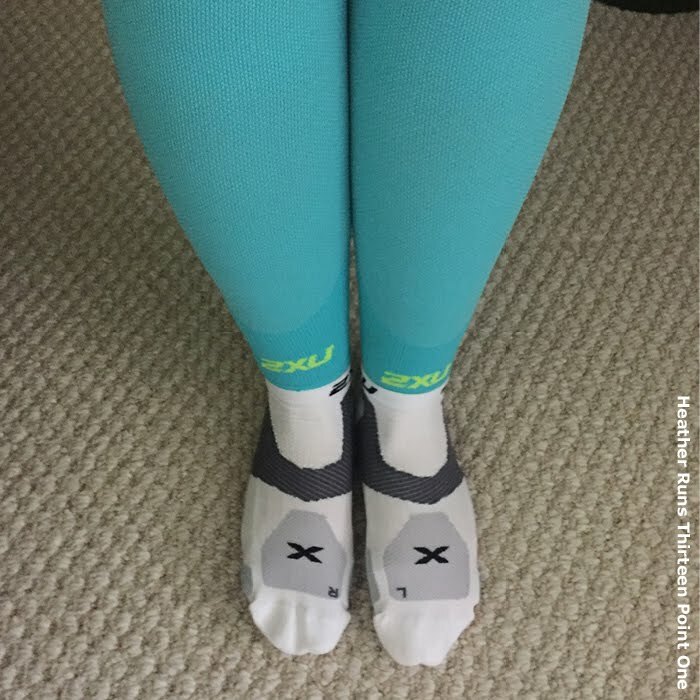 I'm a big believer in compression and 2XU has become one of my favorite running brands. I've never had issues with chaffing or blisters with any of their products. Relaxing in my sleeves and socks. Give 2XU a shot for yourself. You can get 15% off on full price products (cannot be used in conjunction with any other coupon offer) with code TRAIN15. Offer is valid until April 30, 2016. Their new 2016 Collection has some amazing stuff. I'm currently eyeing the mid-rise ICE and Pattern shorts, tech vent short sleeve top, pace 3" 2-in-1 short, and the compression quad sleeve. For reference, the Performance Run Calf Sleeve cost $39.95 and the Race VECTR Sock are $19.95. I find both to be reasonable prices compared to similar products. i recommend all you 2XU brand. It is really effective for me. do you pick your races based on swag?